Candace Yvonne "Candy" Hall obituary. Carnes Funeral Home. Candace “Candy” Yvonne Hall was born in Galveston, Texas on November 12th, 1953. 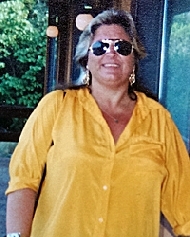 She passed away on Thursday, September 10th, 2015 at the age of sixty-one years in Texas City, Texas. She is preceded in death by her father and mother, Edwin “Eddie” and Ruth Yanch; grandchildren, Gary “Boo Boo” Hall III and Jacob Hall. Candy is survived by her daughter, Kimberly “Kim” Biscamp of Silsbee, Texas; son, Gary Hall Jr. and wife Trisha “TJ” of Starks, Louisiana; grandchildren, Rocky Biscamp Jr., Chelsea Biscamp, Alex Dame, Zane Hall, Zamber Hall, Travis Hall, Sierra Hall and Zachary Newman. Candy was a longtime residence of Texas City and later relocated to Southeast Texas. She then returned to live out her final years in Texas City. She was a very high spirited and venturous woman. She was loved by many. She has now moved on after several years of poor health to be with her friends and family that have preceded her in death. The family will greet visitiors from 6-8pm, Saturday Night, September 12th, 2015 at Carnes Funeral Home - Texas City. She will be missed dearly..